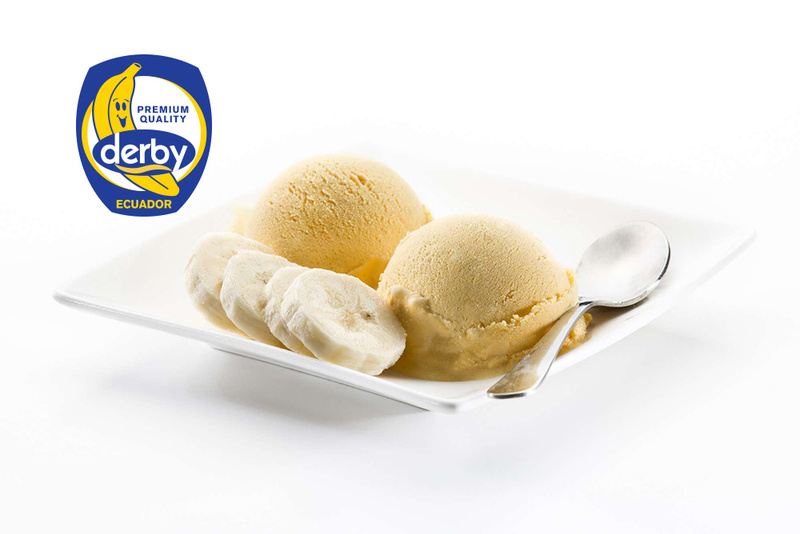 Ice cream from 1 banana | DERBY® PREMIUM BANANAS RASTODER Company - DERBY bananas and other fresh FRUIT and VEGETABLED for you! If you want something cool and refreshing, but you do not have ice cream in your hand, do it in just a few minutes from just 1 banana. You do not need milk, cream, eggs or sugar – just bananas. The more mature they are, the sweeter will be the ice cream. Cut one larger mature banana (for larger quantities increase the number of bananas), cut them on the rollers, place them in the freezer compartment and leave in the freezer for at least two hours, preferably the whole night. Place the frozen bananas in the mixer and start mixing. Do not stop mixing too quickly, because only after a long mixing is a complete creamy shape. Place the contents again in the freezer to solidify. Now the ice cream is over. P. S. Creamy mixtures can also be added to other ingredients that enrich ice cream, such as chocolate pieces, biscuits, a teaspoon of Nutella, half a teaspoon of cinnamon or ginger.